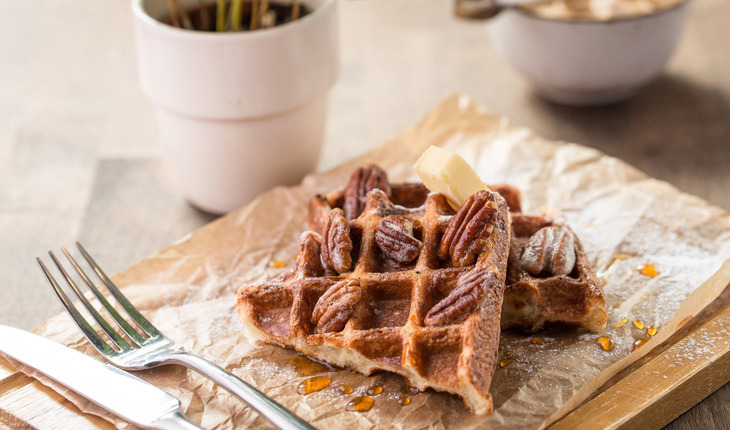 The whole grain goodness of whole wheat, coupled with oats and protein-rich pecans makes for a fabulous waffle recipe. And with the berries on top – this is also deliciously antioxidant rich! Combine flour, oats, baking powder, sugar, and pecans in a large bowl. Combine egg yolks, milk, and coconut oil in a separate bowl, and mix well. Add liquid mixture to the dry ingredients, and stir together. Do not over mix; mixture should be a bit lumpy. Whip egg whites to medium peaks. Gently fold egg whites into batter (for pancakes, see note below). Add fresh fruit to each waffle, and serve. Note: For pancakes, do not separate eggs. Mix whole eggs with milk and coconut oil, and eliminate step 5, and instead of pouring batter into waffle iron, place about 1/4 cup of batter per pancake on a lightly oiled skillet or griddle. Top with coconut yogurt for added deliciousness!